Painting Light by Fred Marsh: Hawkesbury River, Sydney- Arthur Streeton and I.
Hawkesbury River, Sydney- Arthur Streeton and I. 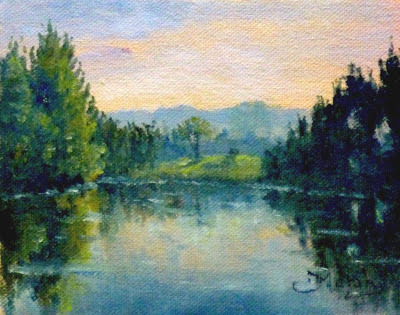 A few weeks ago I travelled to paint the Hawkesbury River near Freemans Reach. The small plein air painting appears below. 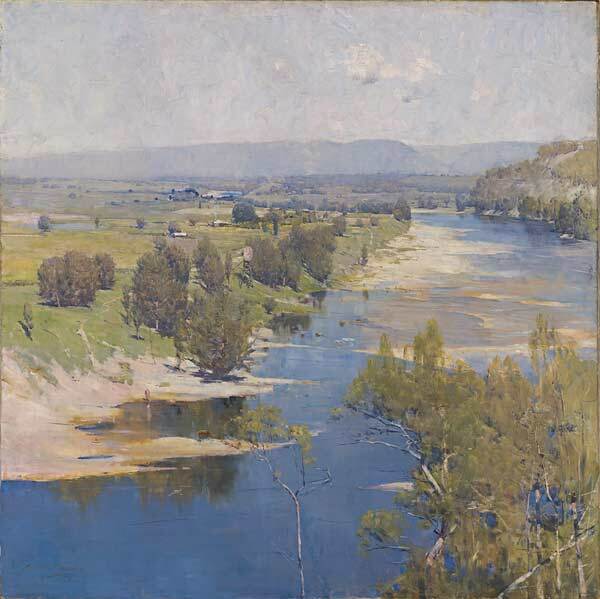 I didn't realise it at the time but I was only a river bend away from where Arthur Streeton in 1896 painted the iconic "The purple noon’s transparent might". I love the deep (but low chroma) blue that Streeton uses in this painting. The site is well marked now as "Streeton Lookout at Freemans Reach" overlooking the spot where Streeton painted the river. When Streeton discovered the Hawkesbury, the river became a subject for a series of large works. Streeton used unorthodox (for the time) shapes for his canvases and used a square one for this "panoramic" painting . He felt that he discovered "the great hidden poetry" of the Australian landscape in the ‘glory of river and plain spread before him. Katherine Tyrrell has an informative post on Arthur Streeton on her blog "Making a Mark", and built a new website about Streeton with links to information and online images. I have recently sketched at a couple of the other Sydney sites ( Coogee and Mosman Bay) that they painted at, and they will feature in a couple of future posts. My other blog "Painted Journey" has paintings and drawings from my second post about the painting trip to Central Australia around Alice Springs. Thanks Katherine for the mention on "Making a Mark" and the heads up re the corrupted link. I tested it at the time of writing, but you are right it had corrupted. Fixed now.